This is one I wrote about last year and turned into a winner. Natty has now risen in April for 9 years running and has a strong seasonal trend of gains that runs from April through June with a cumulative 10-year average gain near 10%. 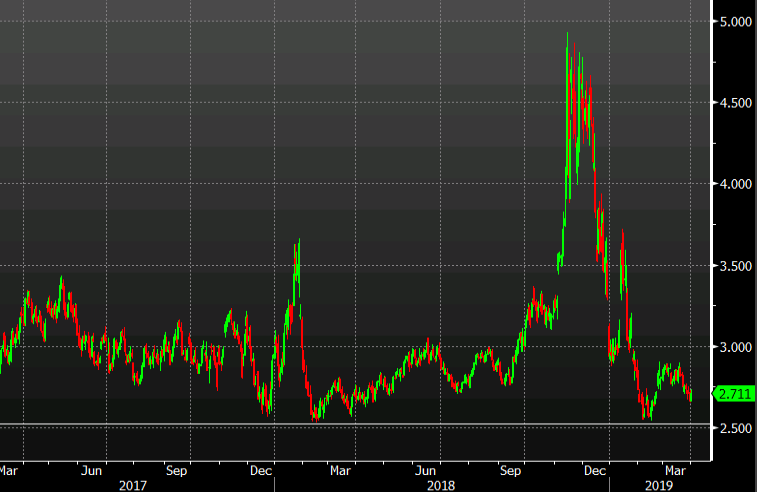 Technically, natural gas is about 5% above the 2019 low near $2.50. That level has been a repeated source of support in the past two years. 2) Will the CAD run continue? The Canadian dollar has been the top performer so far this year and if seasonal patterns hold, the gains will continue in April. The loonie averages a 1.77% gain in April over the past 10 years and has only decline in the month two times since 2006. The strength in the loonie coincides with a seasonal taillwind in oil and natural gas. The US dollar is stronger against the euro and yen in the first hours of April but that might not last. The dollar index average decline in April is 1.1% over the past decade. That's the worst of any month. I'd be a bit worried that soft yields have already baked in some weakness but one catalyst could be weak earnings, more misses on economic data or a souring of US-China relations. Another theory on this is that US stats agencies have struggled to seasonally adjust in Q1 for years and the soft economic data has put a damper on Fed expectations around the month of April each year. Historically, the weakness has been particularly strong against the euro, which also posts its best calendar month in April traditionally. Stock markets globally tend to do well as spring gets underway. The S&P 500 has only fallen once in April since 2005 (a modest -0.75% reading in 2012). The average in the past decade is 1.77%, which makes it only the fifth best month but adjusted for low volatility, it's ranks even higher. April is also a strong performer just about everywhere else. I mean, it can't get any worse right? Brexit is a complete mess and there is no easy resolution but if you are on the fence about buying cable and hoping for a positive outcome, here's something to consider: April is easily the best month for cable over the past decade with an average return just shy of 2%. The bad news is that it was down last April in the first decline in the month since 2004.